According to Jean Choung in last week’s Independent, there are only five horses left at Golden Gate Stables in Golden Gate Park. For 131 years there have been horses in those stables. Wars, epidemics, depression, and bad rock & roll concerts have been unable to clear the public stables. However, SF Mayor Willie Brown’s NYC hired gun, Rec & Park’s director Elizabeth Goldstein is one trip to court away from getting the job done in under a year. Oh, the stables will be back. They’ll be “world class” too. That’s another way of saying only the rich will be able to afford the facilities. Few of the old tenants will return. Getting rid of the old tenants and their low rents is the game. Just as tossing out the present human tenants from the North Beach Housing Projects will do away with most of them forever. Same with the boat slips down in the Marina. And the facilities at Harding Golf Course. It got me to looking out the back window at the orange tree in the corral behind my friend’s building. Almost every downtown block still has at least one stable. They’re the one-story structures that have morphed into garages or grocers. Odd, it was Peskin who carried the ball for the port every down on this one. It was Peskin who introduced the legislation in the board’s Land Use Committee and herded the odious item through there and then, right on past a clueless board. Sue Bierman’s retirement left the space with no elected protector and the vultures were on the space within days. Rose Pak was able to put usually progressive land-use attorney Sue Hestor in yoke with new supervisor Peskin and together they plowed under and paved over the Chinatown end of the park. Peskin then buddied up with DPW to guarantee a permanent swath of the park for DPW. 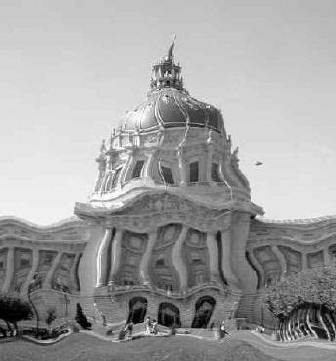 Peskin then arranged amendments promising more pieces of the park to Muni. He capped off the vivisection by handing the sub-surface of the eastern end of the parcel to the Port Authority. The same authority, incidentally, which was advertising in brochures that it had over 2,000 parking spaces around the Ferry Building. Why more? Why ask? Peskin is an outdoors kind of guy. I don’t think he hates parks. This is about brokering power. It’s about millions of dollars in construction first. Imagine the money going into this little space. Imagine the construction contracts. Instead of just leaving a cool green space with large trees where thousands can relax … get everyone involved! Bring in DPW to build a road and a maintenance shed. Muni can build a platform or two. The Port Authority can build a big garage and putting the thing under Rec & Park makes it eligible for part of that 450 million dollar bond pie burning a hole in Willie’s pocket. So what if you have to toss out old people and horses and dogs and boats and golfers and … you get the idea. Other than when I got pissed and recommended nuking half the world on September 12, I’m generally, a lock-step progressive kind of guy. It is thus, with great sadness, that I again break ranks and re-endorse Neil Eisenberg for city attorney. Hey, folks, he’s best. Did y’all see the League of Women Voters’ debate? Lazarus and Herrera are a pair of ventriloquists’ dummies. I really liked Williams. He’s lost the glasses and the blow-dry and projected something of an innocence. Still, there’s that Peskin machine connection. Williams and Hestor partook in the Ferry Park sell-out when it suited them. Hey, they’ve done more good than bad, but they are, after all … lawyers. The only reason my friend Jerry Threet had such a shopping list of Eisenberg sins over the years is simply that Eisenberg is older. If you judge lawyers by their clients, … well, don’t go there. Judge em on ability and independence. As best I can determine, I’m the only person in town supporting Eisenberg. That makes him very independent. If I can get him to shave his head, throw in a heavy gold loop earring and maybe take on a strategic tattoo or two, the man could turn a head or two. OK, maybe that ain’t the path. How’s about this: go to just one of their debates or watch one on Channel 26. There is really no comparison. God didn’t give Neil Eisenberg the wardrobe, looks, hair, or slick personality she gave the others in the race. Neil got the brains. Lots of em. He’s gruff. He’s sarcastic. He’s tough. He’s neither owned by nor cowed by anyone in this town. He’s already proven he’ll stand up to the biggest bullies in town. Eisenberg for city attorney. I want to thank MUD District Rep candidate Jim Reid for keeping Willie Brown’s trap shut for the past nine months. Reid is the builder who ran the “Recall Willie Brown” effort for the past year or so. I’m truly sorry it didn’t succeed in unhorsing The Mayor but it sure kept him looking over his shoulder. No doubt it kept Reid looking over his shoulder too. Thanks, Jim. How about a new “Recall the Mayor” petition for next year? It’s never too late to challenge a tyrant. Jeff Adachi for public defender. Cause his daddy didn’t get him the job. Susan Leal for treasurer. Cause I always wanted to be a lesbian. Yes on every single proposition except “A.” That’s opposite the mayor’s recommendations and that’s no accident.